An interesting thing about having kids is realizing how our own childhood memories can impact our parenting choices, and sometimes celebrating the holidays brings out the best and the worst in us all. When you add being a Solo Mom of a child or children with special needs to the mix, our expectations of what defines a successful celebration can crash right into the realities of having kids whose definition of “success” is very different from our own. The Fourth of July is one of those celebrations. When I was a kid and the laws about fireworks were much more relaxed, we would nail pinwheels to the telephone poles, and the dads would light them for us. The neighborhood all came together and lit fireworks. If a kid got scared, he could just go watch from inside his house or snuggle in his mom’s lap covered in a blanket. The explosions back then were smaller than the big firework displays at community events these days, and they were much more sensory-friendly. In many areas, the only way to see fireworks is to gather in large groups and watch a professional show. This is usually a sensory disaster for many of our kids with special needs. It includes large crowds, long lines, loud music, and booming explosions overhead. Most of the time, we just don’t go to the big events and choose to watch fireworks on TV instead, or we go to a quiet place further away to watch them in the distance. But sometimes it’s a family gathering, and everyone is expected to go. If you really feel you can’t say no, then do all you can to make it easier on your child. Bring headphones, dark glasses, and hats to block out as much of the lights and sounds as possible. 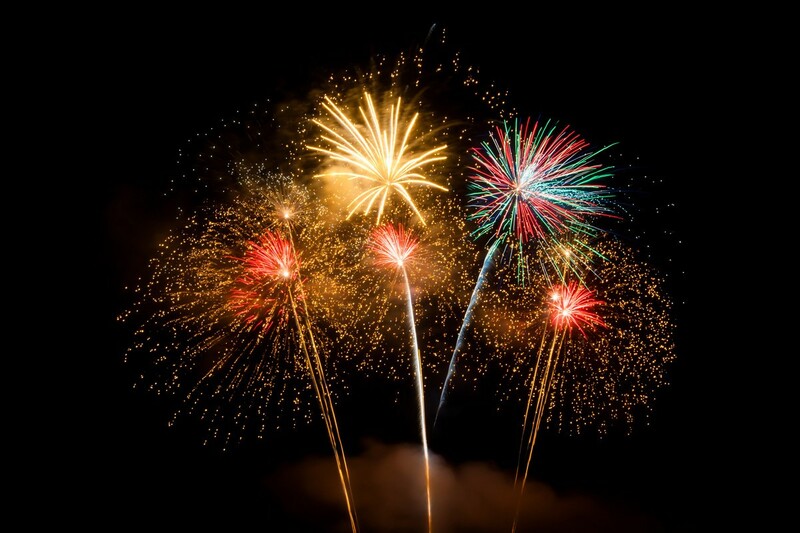 If it’s your child’s first fireworks show, watch some YouTube videos of a big show in advance so she knows what to expect. Give your child an agenda of the evening, and factor in the long lines to get in and out of most venues. Consider alternative transportation to avoid parking-lot backups. Bring healthy snacks, and go light on drinks, as bathrooms may be hard to find and also might have long lines. Bring comfort items. Depending on what your child likes, these could be stuffed animals, books, or a handheld gaming system. Be prepared to ask family members to not judge or try to convince your child to watch if he doesn’t want to. For several years, when my kids were young and overwhelmed inside the local college stadium, we would ride bikes to the grassy areas at the edges of the campus, set up blankets, pull out a picnic basket, and let the kids eat, run around, or hide under the blanket. The bike ride helped calm them, and being a bit further away, they had more control over what they watched. For some Solo Mom families, avoiding all group celebrations is the best choice. For others, it might be going out during the day to the pool or lake for a swim and getting home before the pops and whistles of fireworks really get going. You may need to plan for a dance party or to watch a movie to reduce the audio impact. Since many dogs are also very sensitive to fireworks, you could make a plan to take care of your pets if you have them. Having a job for your kid(s) with special needs to do can reduce the attention on the fireworks themselves. As my daughter got older, she was able to say that she didn’t want to see any shows and felt safest if she was home on the Fourth of July. Though I enjoy a great fireworks show, I have seen plenty and know I will see them again. I used to make her go see a show from a distance, but even that is not enjoyable to her, so now we plan for a quiet night in. And we have a dog that trembles and hides, so taking care of her helps. It also gives us ways to talk about sensory needs that are not about my daughter directly. I might ask her what she thinks would make the dog feel better, which are usually the same things that make her feel better—a small, darkish space, squeezing or body pressure, music, some jokes (laughing helps her not hold her breath), and some unexpected treats. For a few years, all three of us of ended up in my bed in the dark! I have to confess that I do like to get a bunch of sparklers (with a holder for little hands) and light them in the backyard at dusk. I still like to write my name with them, just like I did when I was a kid. The Fourth of July is a sensory-heavy day for most. It doesn’t have to be for you. Reading about America’s independence or making red, white, and blue cupcakes can help you honor this important day and create fun for everyone. I hope you enjoy the day. Happy Fourth of July!